The third day of April, 2016, looks like, feels like, a January day. A winter storm blew in during the night— not the light and fluffy flakes of my recent Foolish-Worry post— but a wind driven, watery, stick-to-the pavement snow cover. My effort at gratitude is fleeting. I worry for the baby tulips and flowering primrose shivering under the flower-pots I put down yesterday. I worry for the lily plants with nubile leaves and of course, the daffodils in full bloom matted down with ice. What will become of them? By noon, the sun radiant, the lily leaves emerged, unharmed. The daffodils were barely visible, their necks bent, their blooms buried in snow. With gratitude, I watched a well-fed robin, fresh from a snow shower, pivot the plantings. Mid-afternoon, I dressed for wind, wearing my purple fleece and snug-over-the ear cap. Pruners in hand, I clipped daffodil stems. I was gloveless and surprised at how cold the stems felt in my palm. Many of the blossoms, though frosted, were intact. Grateful, I gathered a bouquet of two-dozen to bring inside. Given that high winds and more snow were in the forecast for the next day, I savored them all the more. The Alberta Express came through at night, bringing near freeze. At dawn, I checked the front garden from the second floor picture window. The picture was bleak. My garden was shrouded in snow. It snowed all day long. April 4th might just have well been January 4th except for the yellow flashes of forsythia floating above snow puffs and the bud shapes outlined along tree branches. Yes, we have had similar storms in April. At my former residence, years ago, a magnolia in full bloom was severed by the wind. It recovered, thanks to good pruning. Twenty years ago, that storm seemed like an anomaly. My garden is teaching me otherwise. The warm winter, the frigid spring, the rapid temperature changes. This spring of 2016, so unusual and unpredictable, requires a different mind-set. I am grateful for the scientists who persist and are transparent in their findings. Denial is becoming less and less possible. As a gardener, I bear witness first hand. Yes, the daffodils survived as did most of the plants; but for how long? We can no longer avoid the presence of climate change or the need to do what we can to deter or remediate it. 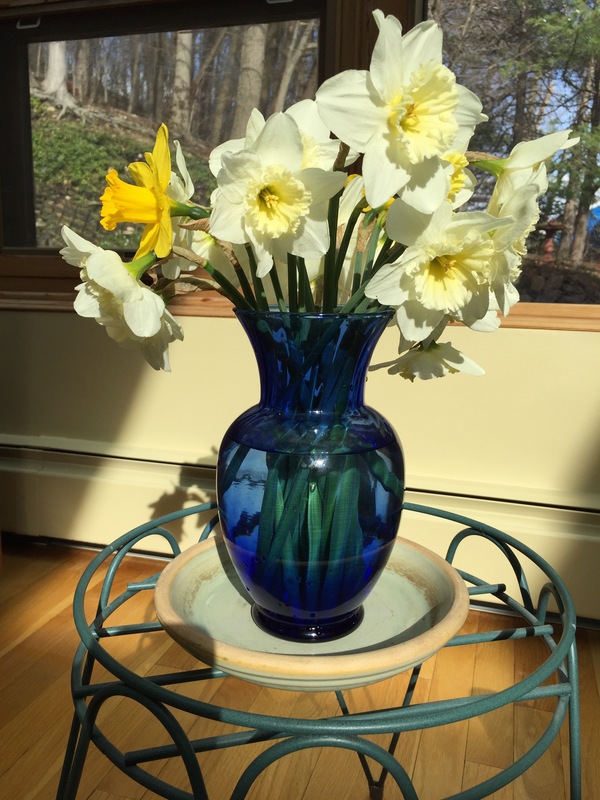 This entry was posted in Currents, Mindfulness, Nature, Relationship(s), Sustainability, Well-Being and tagged Climate change, Grateful Gardener, gratitude writing, mindfulness, spring snow, Unpredictable Temperatures on April 11, 2016 by fayewriter. The day before the winter Solstice, I stopped in my tracks at the sight of a dandelion in bloom under an evergreen shrub. 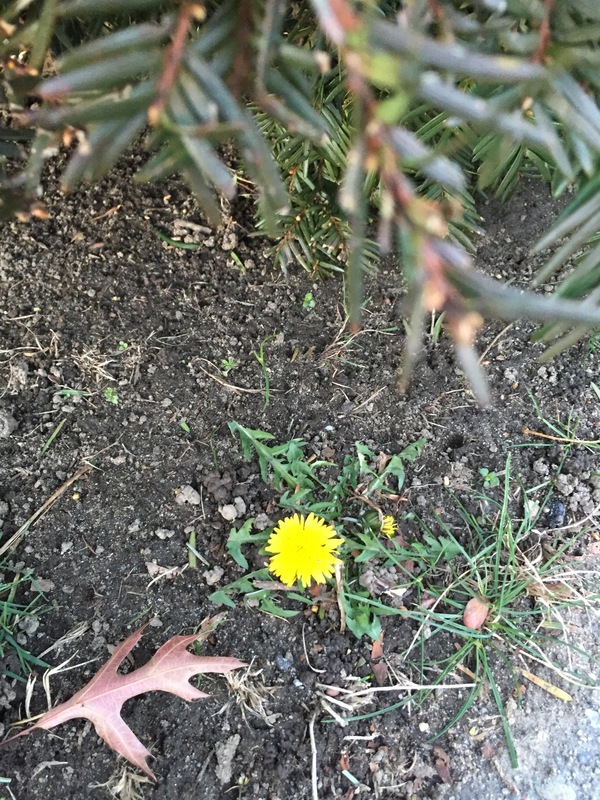 On December 20th, a dandelion in bloom in a Boston suburb is of note. I pulled out my IPhone and bent low, to snap a few pictures. I wanted to show the contrast between the faded shrub branch and the flagrant yellow dandelion bloom. It’s clear that mindfulness has sensitized me. A week ago, a lone mosquito did a slow solo across my dinner plate. My swat was automatic. I was surprised by its presence— grateful it was so sleepy and with no interest in attacking me. But still, it was unnerving to realize that a mosquito was still hanging around in December and to be reminded that of course, warming temperatures affect the life cycle of plants and insects. A December bloom and a sleepy mosquito are clear signs of digression from the norm and raised my concern about the effects of climate change. But the effects of warming are minimal in my life compared to the experience of the fishing village of Vunidogoloa, on Vanua Levu, Fiji’s second largest island whose residents had to abandon their idyllic home to relocate to higher and drier land because of sea level rise, erosion and flooding. My heart soared when I read of how the Fiji Islanders fierce concern about climate change and its effects were reported at the recent United Nations Paris Conference. The Fiji villagers contributed very little to climate change, yet their homes and everything they owned have been bathed again and again in rising and unruly tidal waters. Clear and certain of the need for change and adaptation both at home and at the global level, their Third Pacific Islands Development Forum issued a Suva Climate Declaration this past September. I am grateful for the clarity and wisdom of their words and want to share the first three points. 2. We express profound concern that the scientific evidence unequivocally proves that the climate system is warming and that human influence on the climate system is clear, but appropriate responses are lacking. enough. And we have. And it is all the more powerful for that. You can download the entire text at here. a world-wide climate agreement involving 196 nations. I am grateful to begin 2016 with hope for our planet. 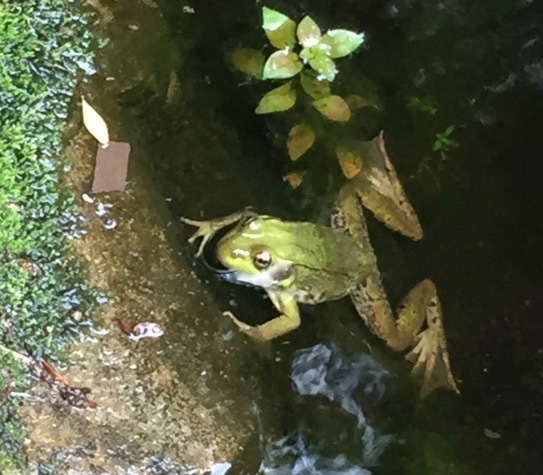 This entry was posted in Currents, Mindfulness, Nature, Sustainability, Well-Being and tagged Climate change, Fiji Islanders, Paris climate change conference on December 28, 2015 by fayewriter.